The self-packing polypeptide puzzle: how do proteins fold, unfold and misfold? In one of the most intriguing examples of biological wizardry, in every cell, every second, thousands of proteins self-pack into the unique shapes that hold the key to their function. In essence, a freshly-formed chain of amino acids bends, loops, twists, coils and collapses on itself to produce the finished design. We know that these rearrangements are determined by chemical attractions between the amino acids. But in stark contrast to our knowledge of the digital precision by which DNA codes the sequence of amino acids, the chemical forces that direct folding act in an incompletely understood, nebulous way, much as the weather is ruled by physical processes. A predictive model for protein structure remains one of science's holiest grails, promising incredible benefits throughout the biomedical sciences. In our lab the quest is focused on observations of real instances of protein folding, unfolding and misfolding, a complementary and ground-truthing approach to algorithm-based models. Using small proteins (e.g. barstar, monellin), and techniques that monitor shape changes with nano-to-microsecond resolution, we are answering questions fundamental to solving the self-packing puzzle: Do proteins take shape gradually or in fits and starts? Is there only one folding sequence for each protein? How sensitive is folding to cellular conditions? What comes first - an "outline" of the shape or its details? We are also applying our expertise to protein unfolding and most recently to misfolding - an all-too-common problem that can cause proteins to aggregate into fibrillar masses, most tragically causing the neurodegeneration of Alzheimer's disease. Goluguri, R.R., and Udgaonkar, J.B. (2016). Microsecond Rearrangements of Hydrophobic Clusters in an Initially Collapsed Globule Prime Structure Formation during the Folding of a Small Protein. J. Mol. Biol. 428, 3102–3117. Malhotra, P., and Udgaonkar, J.B. (2016). Secondary Structural Change Can Occur Diffusely and Not Modularly during Protein Folding and Unfolding Reactions. J. Am. Chem. Soc. 138, 5866–5878. 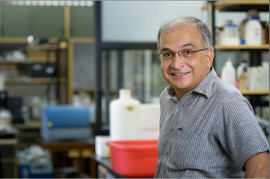 Sabareesan, A.T., and Udgaonkar, J.B. (2016). Pathogenic Mutations within the Disordered Palindromic Region of the Prion Protein Induce Structure Therein and Accelerate the Formation of Misfolded Oligomers. J. Mol. Biol. 428, 3935–3947.